I loved this pizza so much that I have suggested fellow guests at the Ascent hostel join me there several times afterward. Each has commented on how good the pizza at Pizza Simta is. 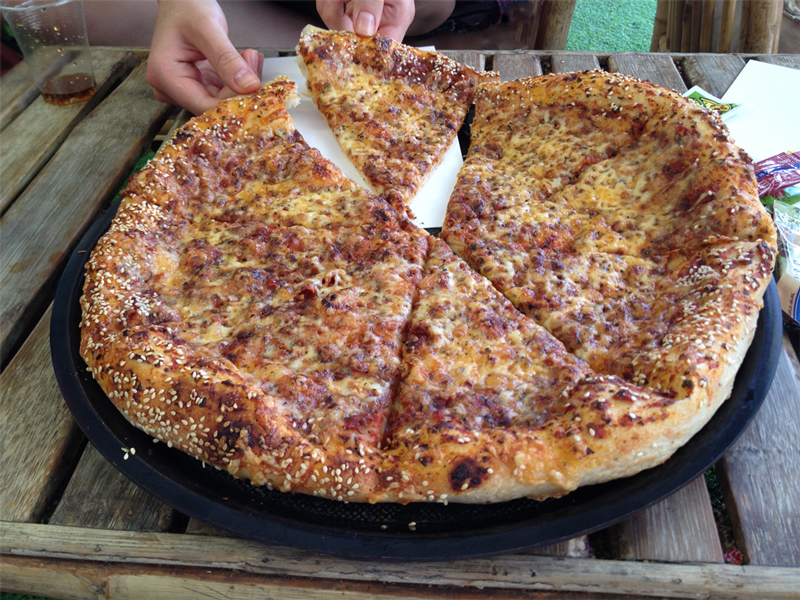 The sesame seeds atop the crust, I once remarked to a local Tzfat woman, are a fabulous touch. 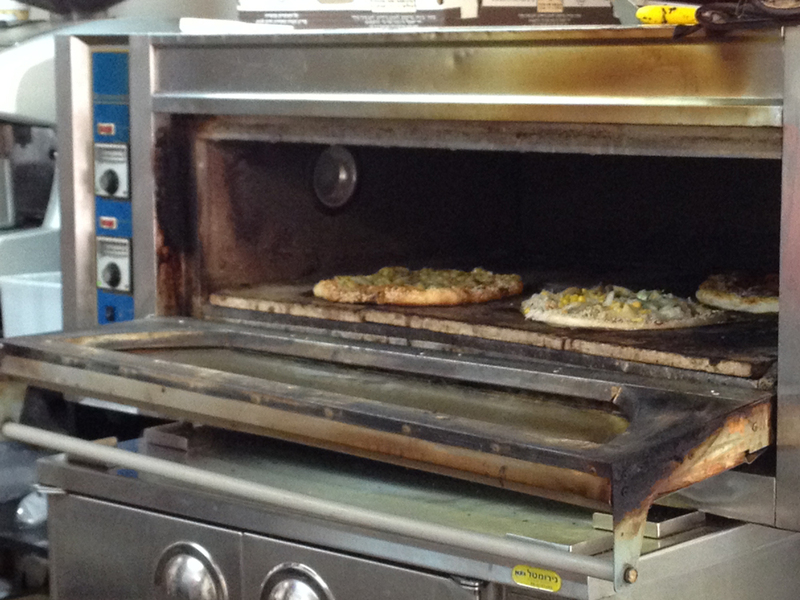 “They’re a Tzfat thing,” she replied, “most of the pizza in Tzfat does the same.” I’ve seen this at some, maybe all, but Pizza Simta still seems to do even that better than the others. My first experiences at this place were in the cooler or freezing cold winter evenings. Throughout an entire winter, this pizza was consistently great and its warmth is always welcome. The decor is nice too. Not fancy, but comfortable. The green grass carpet and the bamboo seats make it feel a bit outdoorsy. 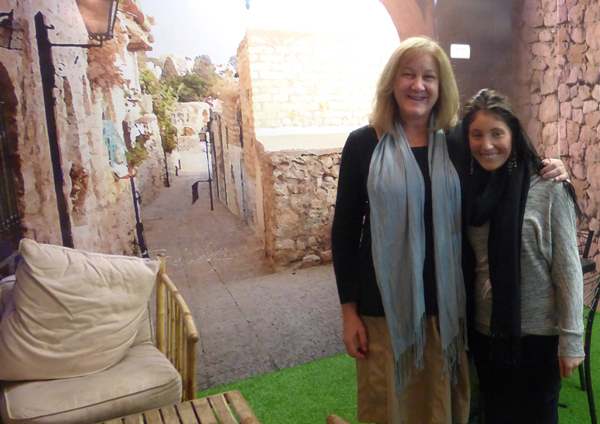 One entire wall is a mural that makes you feel like you’re outside in an old city. In fact, a funny thing is that I asked someone once to take a photo of me and a friend there, and looking at the photo you’d never know we were indoors or indoors at a pizza place. Pizza being made right in front of you! A friend taking the first crispy slice. As I write this, a large pizza and a liter of Coke is 35 NIS. Of course the exchange rate fluctuates but it’s roughly 3.5 – 4 NIS per dollar so it’s around $8.75 – $10. This will stuff two hungry people and well satiate three. Pizza is not sold by the slice here. 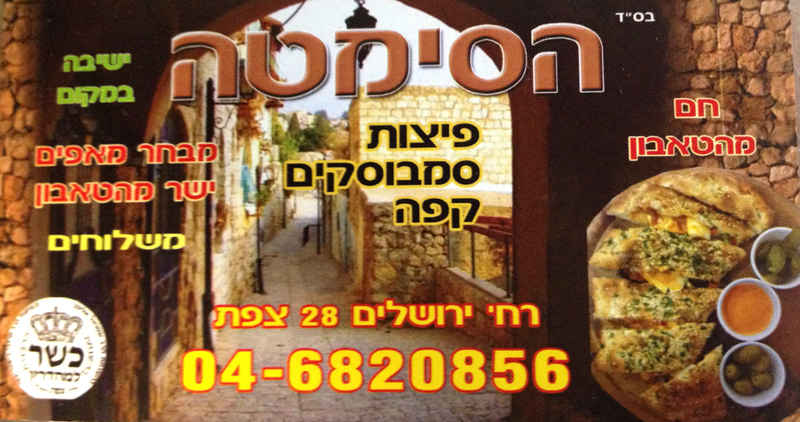 Instead, you can order an individual pizza for 15 NIS. I did that once with a friend who wanted several toppings as I prefer the pure experience. Some of us have tried to figure out whether two individual pizzas are equal to an entire large one. Sometimes, they appear to be roughly the same, but I think the large pie is a better deal. They don’t call it Calzone and I don’t read Hebrew so it took me a while to learn that they make calzone as well. One day I saw someone getting one. Nice and crispy. Choose your own fillings. My pizza standard was formed by growing up with NY and then NYC pizza. It was furthered by pizza in Naples, Italy. If I had pizza in other states or countries, I was unimpressed to remember it either way. Having eaten Kosher pizza many times in Los Angeles, I had formed the opinion that Kosher Pizza wasn’t something to ever subject myself to again. So, when out with several great Ascent guests, one particularly nice guy really wanted pizza, I consented and silently considered it a mitzvah of self-sacrifice. Boy, was I surprised when I saw the pizzas coming out of this over — and when I had my first taste of this pizza! It was so great! It turns out that awful pizza is not a Kosher thing, it’s just the typical awful LA pizza magnified. Almost all pizza in LA is not only not worth paying for and not worth ingesting a single calorie; it also just tastes like canned tomato paste on soggy dough. Starting with this fabulous pizza, I was open to trying pizza in Israel. So, in Tzfat I have had pizza from three other pizza places. Pizza Milano was also good. One of the others I cannot recommend and won’t have again. But this one remains my favorite and I return over and over, never to be disappointed. 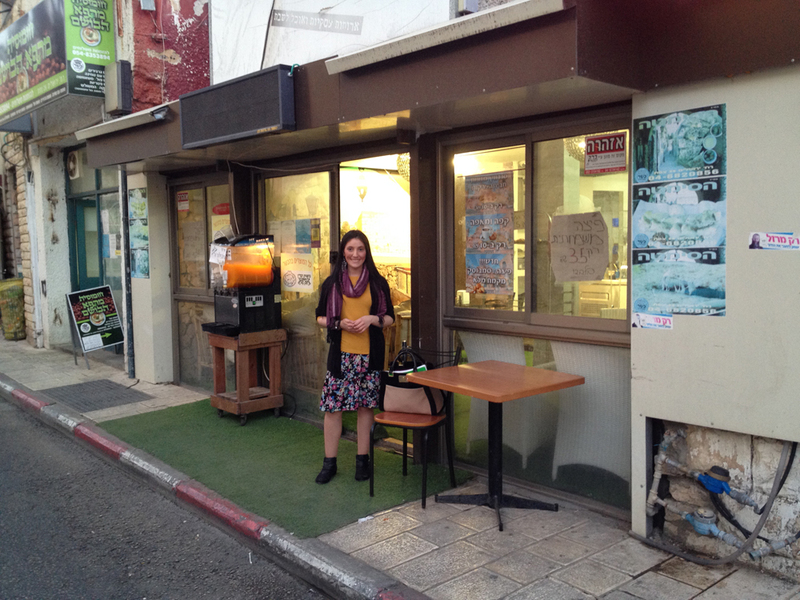 Pizza Simta is located on Rehove Jerusalem, across the street from a 7-story apartment building that stands high above the others. You’ll recognize it by the green outdoor carpeting on the sidewalk. 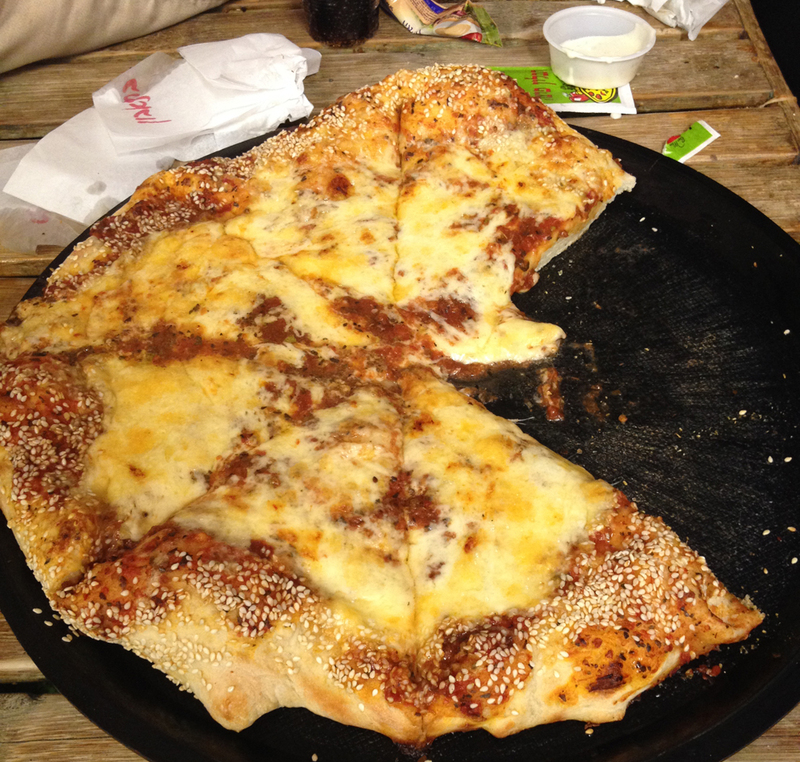 I also had a great pizza in Jerusalem at Big Apple Pizza. I think it was 45 NIS for a large pie. Yes! 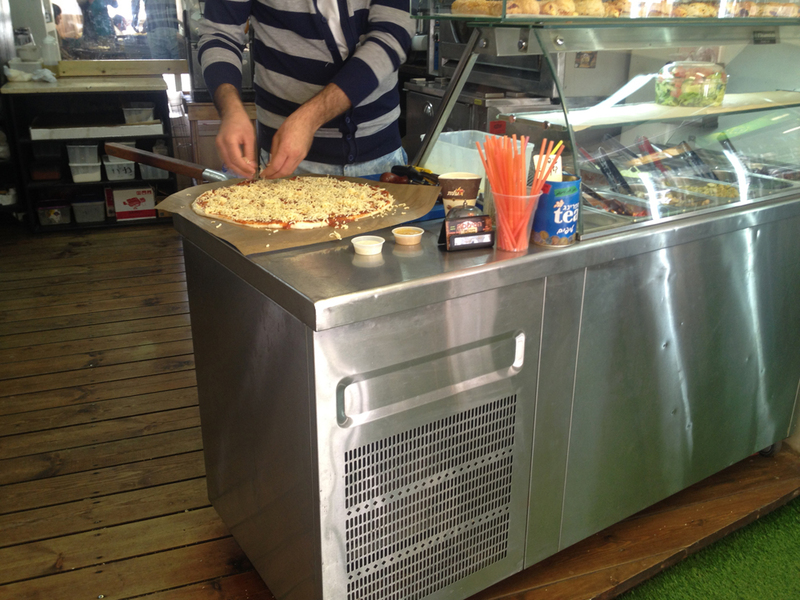 My favorite pizza was also in Tzfat!